You Are Loved Gold Keychain - for Those You Love "I wish I could show you when you are lonely or in darkness the astonishing light of your being." You Are Loved Gold Medallion - for Those You Love "I wish I could show you when you are lonely or in darkness the astonishing light of your being." 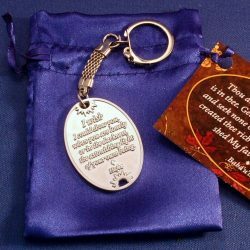 You Are Loved Silver Keychain - for Those You Love "I wish I could show you when you are lonely or in darkness the astonishing light of your being." 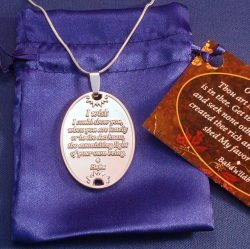 You Are Loved Silver Pendant - for Those You Love "I wish I could show you when you are lonely or in darkness the astonishing light of your being." 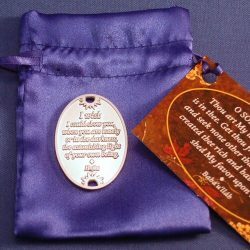 You Are Loved Silver Medallion - for Those You Love "I wish I could show you when you are lonely or in darkness the astonishing light of your being." A child sized, glow in the dark, awareness bracelet that says Illumine My Heart. This bracelet supports their spiritual growth in a clear, but non-preachy way. It is a "prayer" without really being a prayer or mentioning God. A child sized, glow in the dark, awareness bracelet that says Illumine My Heart. It is appropriate for children of any background and makes a great gift at children's classes. Soft silicone is safe for children over 3 to wear in bed, and the blue printing means you can read it in the dark. How cool is that! World Citizen Awareness Bracelets let people know that you feel like you are a citizen of the world. You believe in the fundamental unity of all people. These World Citizen lanyards are printed in white on both sides of a royal blue woven polyester ribbon. They have a break-away safety clasp in the back, and a detachable clip that has its own loop of fabric to make it easy to carry. Short lanyards with a carabiner at one end and a split ring at the other are the most convenient way to keep from losing important items like keys, phones and electronic devices. Ours say World Citizen on a cobalt blue woven strap. It is printed on both sides, and matches our long neck lanyard. Gold Plated Treble Clef Star Pendant Singers, musicians, and music-lovers alike will resonate with this pendant design. The nine-pointed star is made from the treble clef symbol, spun around a central point. It is 36mm (1-3/8") and comes in two finishes - sterling silver plating with sky blue and gold plating with royal blue. The color is true cloisonne - which is becoming a lost art as companies move to plastic and enamel paint. Singers, musicians, and music-lovers alike will resonate with this pendant design. The nine-pointed star is made from the treble clef symbol, spun around a central point. It is 36mm (1-3/8") and comes in two finishes - sterling silver plating with sky blue and gold plating with royal blue. The color is true cloisonne - which is becoming a lost art as companies move to plastic and enamel paint. We sometimes include these satin pouches with pendant and chain orders, but if you want to make sure you get one (especially if you are only ordering a pendant without a chain) then order it here. It is 2x2.5" - just big enough for a pendant or pendant and chain. We have them in black, maroon, gold and silver.